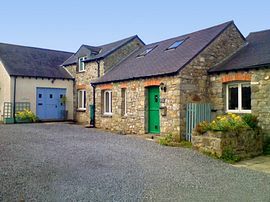 You are here: Holiday Cottages / Pembrokeshire / Groom's Cottage, Mews, Coach House. Grooms Cottage, The Mews, Coach House: Bosherston. 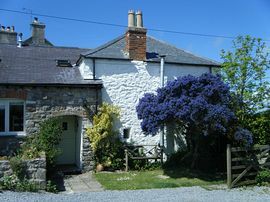 These charming cottages are just a few minutes walk from the famous Bosherston Lily Ponds and The National Trust's Stackpole Estate, featured on the BBCs nature programme, Autumn Watch. 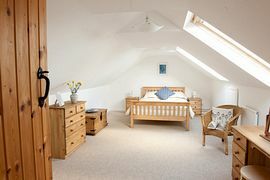 The cottages are set in the heart of the South Pembrokeshire National Park; a beautiful part of the country with miles of world-famous coastline to explore, including awe-inspiring views of St Govans Head, Huntsmans Leap, Stack Rocks and Green Bridge of Wales and the evocative St Govans Chapel. 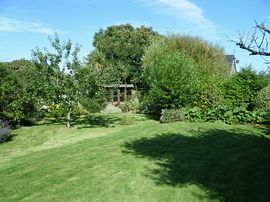 Each cottage has its own enclosed, pet-safe, sunny garden accessed across an attractive courtyard with BBQ, and garden furniture for enjoying al fresco dining in peace and privacy. Groom's Cottage also has a lovely summerhouse, and The Mews has patio doors that open out into the garden. Minutes from Bosherstons village pub. The St Govans Inn serves tasty food and great real ales, and the renowned village cafe sells cream teas to die for! In nearby Stackpole, The Stackpole Inn has a fantastic reputation for fresh, local food. Otters, kingfishers and woodpeckers live nearby in and around the Lily Ponds in Bosherston, while walkers along the coast often spot seals, dolphins, rare choughs and other sea birds. This part of Pembrokeshire is a haven for wildlife. Pembrokeshire beaches on your doorstep. Take a peaceful walk via the Bosherston Lily Ponds and woodland to the glorious, unspoilt Broad Haven South Beach, or stroll over the headland to Barafundle Bay � voted the most beautiful beach in Britain by National Trust members. Few minutes walk from the famous Bosherston Lily Ponds. all bed linen is provided. Towels available for small extra charge. Private walled gardens, barbecue and garden furniture. Directions available on request.See Map. We offer discounts for late bookings, and discounts for larger families and groups wishing to book more than one of our cottages. We also offer the Mews and Coach House for holiday letting in the same Mews complex. Open all year round for our guests. Kind comments from happy guests. We saw otters in the Lily Ponds on five occasions We've had a fantastic time here. The boat trip from Martin's Haven (Marloes) around Skomer was fantastic. Incredible numbers of guillemots & razorbills. Not only that but we saw otters in the Lily Ponds on five occasions � wonderful! Perfect cottage, perfect location for a family cottage holiday. Very child and dog friendly. Loved the garden. Favourite spot? Broad Haven beach! We fell in love with Broad Haven Beach I'm writing to say what an amazing week we had at Groom's Cottage. Your cottage was perfect for us, having a toddler and two dogs. We fell in love with Broad Haven beach. I would certainly recommend it to all my friends. Enjoyed walking to Barafundle beach Had lots of walks around Bosherston Lily Ponds � think we saw an otter! Lovely location. We liked Carew Castle and the boat trip around Skomer island. Home from home Our holiday was perfect � the location excellent. Thank you for making this a home from home. The kids loved the toys & books.Thanks again, I have been spreading the word!! Thank you for a lovely week at Groom's Cottage, we loved the house and the area, did lots of walking. The garden was idyllic and so peaceful. Thanks for a lovely stay at Groom's Cottage. My daughter was particularly pleased to find some Enid Blyton books that she hadn't read, so spent every spare moment reading so she got through them before we left. My father in law said it's the most relaxed he has felt in such a long time! We had such a fantastic holiday. The cottage was incredibly comfortable and so well laid out. The garden was a bonus � the kids scrumped an apple for their lunch most days. The garden is amazing, perfect for a late afternoon Pimms in the Summer House. A wonderful week, one of the nicest cottages we have ever stayed in! So much to do and see in the area, highlights being evening strolls around the Lily Ponds; coastal walks from Broad Haven; St Govan's Head; Carew Castle; relaxing on Tenby beach; St David's Cathedral; We've had a really lovely week away. The lads did plenty of fishing & caught six pikes (and lost lots!). Plenty of walks around Lily Ponds to nearby beaches and visits to Pembroke and Carew castle.